The dishwasher is one of our most convenient appliances saving labor and time. That’s why it’s important to use and maintain this important appliance correctly to keep it running smoothly. Run water in your kitchen sink until it turns hot. Then start the dishwasher. This will get hot water to the appliance from the start of the wash cycle. Don’t overfill the dishwasher. Too many dishes crammed into the racks will prevent the water spray from reaching all areas of the dishwasher. Then you will have to rewash some of the dishes. Scrape any remaining food bits on dishes into the garbage disposal. There is no need to pre-rinse the dishes. Today’s dishwashers are able to remove even sticky food particles from dishes. Load utensils with the handles downward in the utensil basket. Better water circulation will aid in cleaning them. Of course, sharp knives should be placed with the blade down. Any cutlery with wood handles should be washed by hand instead. Use powder dishwasher detergent. The hard-formed single-dose capsules are a good choice because the amount of detergent is pre-determined. Gels tend to leave film on glasses. Also, bleach is often an ingredient in gels. Bleach can harm the door gaskets. Never use detergents intended for other purposes. Be energy efficient by avoiding use of the delay cycle and the heated dry setting. Also, run full loads. A half empty dishwasher uses the same energy as a full one. Check to make sure your dishwasher is level. If it isn’t level, the dishwasher could leak. Raise or lower the feet until the appliance becomes level. Clean the screen and/or filter located under the spray arm at the bottom of the dishwasher on a regular basis. The filter and/or screen collect large food and debris. Follow instructions in the owner’s manual for cleaning the filter. Inspect gaskets around the dishwasher door and frame for gaps, cracks or signs of deterioration. These gaskets provide a tight seal when the appliance is running. If you notice water on the floor after the appliance has run, the gaskets may need to be replaced. Food debris can attach to the gaskets and weaken them over time. Keep the gaskets in good condition by cleaning them with a soft brush or damp towel. Check the sprayer arm holes for food particles and debris. If these holes are clogged, the water cannot circulate freely throughout the dishwasher. Use a thin stiff wire or toothpick to clear debris from these holes. Inspect every niche and corner in search of food particles to prevent bad odors. Using the dishwasher on a regular basis helps prevent food debris from building up. To clean out old food particles, pour a cup of white vinegar in the bottom of the empty appliance. Run a normal cycle. Examine the dish racks for areas where the plastic coating may have worn off. Repair these areas to prevent rust from developing. Rust can lead to corrosion that can cause problems for the pump. Purchase replacement rubber tips for the rack tines. 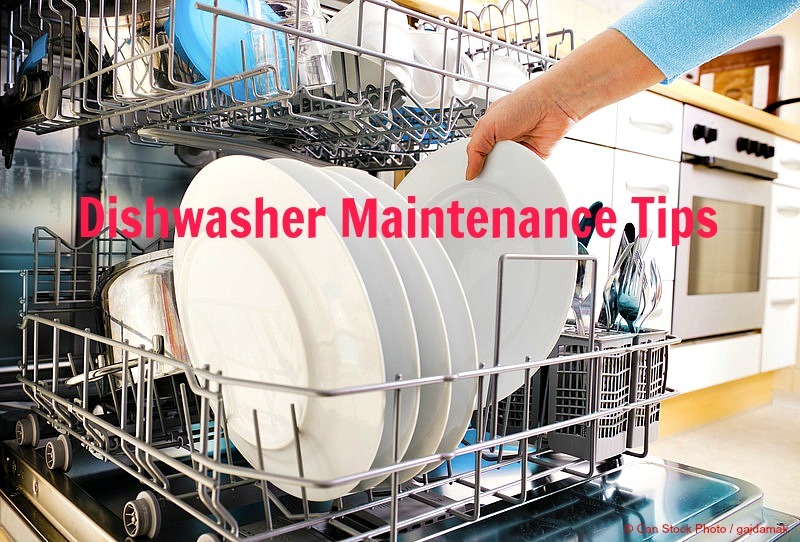 Keep up with these basic maintenance tasks and your dishwasher should remain in good working condition for many years.